Editor-in-Chief Paula Gaetos chats with artist Kyle Carrozza, creator of the Cartoon Network animated series, Mighty Magiswords. 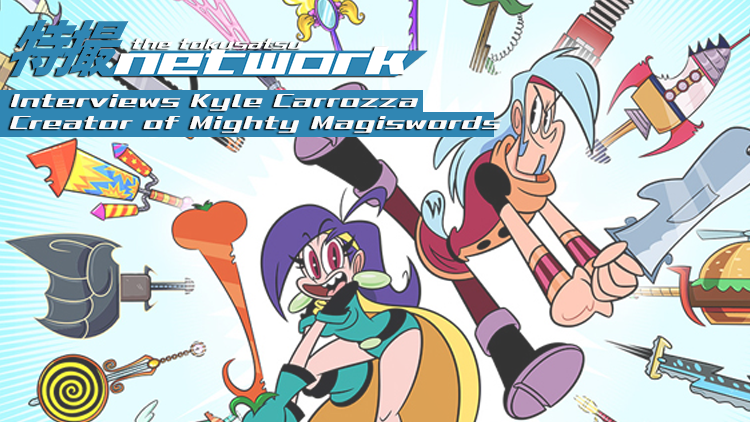 Kyle Carrozza was the Tokusatsu Network's inaugural Artist Feature and we were very happy to be able to chat with him about his latest work on Cartoon Network, Mighty Magiswords. Mighty Magiswords is set to premiere on September 29th at 6:30pm. The show centers around the adventuring siblings, Prohyas and Vambre, and their trusted, fun, and, often times, ridiculous Magiswords. The show builds on the original 15-second series that launched the previous year on the interactive CN Anything app. Concurrent with the upcoming TV series production, almost 400 pieces of platform-specific original content have been custom developed, including shorts, vlogs, web and mobile games, and interactive narrative content—and all will be enhanced with proprietary technology allowing fans to participate in the world and collect their favorite swords. Fans can check out the five minute minisode "Pool Fools" on the Cartoon Network YouTube channel and play the slightly addicting Hoversword Hustle game on Cartoon Network's website. Fans can also see the first full preview episode of Mighty Magiswords for free on iTunes and purchase the whole season as it's released. A very special thanks to Kyle Carrozza and Melissa Mills for making this episode possible.